The availability of the CQ WW public logs covering the period 2005 to 2016 allows us to look at various trends over that period, in addition to the trends in hourly QSO rates already documented.. 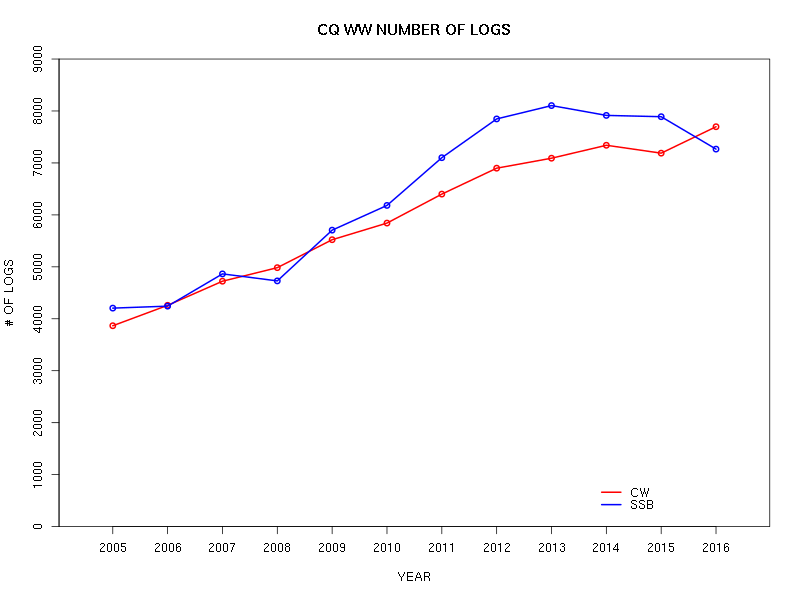 It will be interesting to see next year whether the 2016 points are an aberration (although I caution against reading much into the mere number of logs submitted; still, the reversal between CW and SSB in 2016 is worth at least a mention). Last year I wondered whether the assisted numbers would exceed the unassisted numbers in 2016; they didn't, but it's getting very close (on CW). 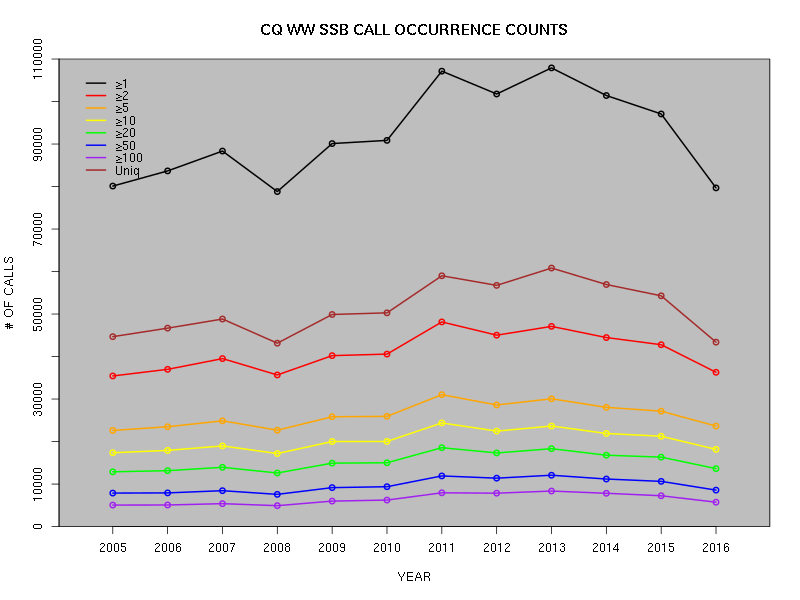 This, I expect, is a reflection of the utility of the RBN, which can make the assisted category far more attractive, especially for the mass of relatively casual operators whose QSOs come solely from point-and-click QSOs. 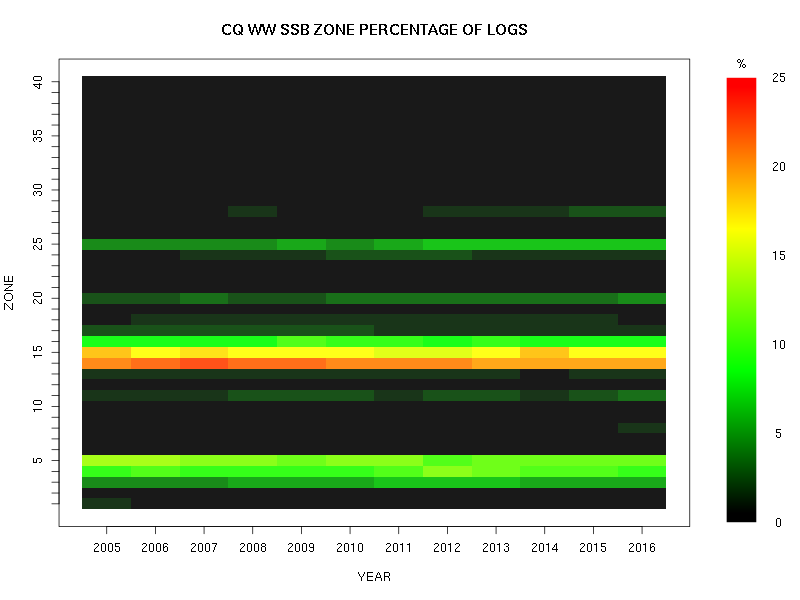 Nothing much there either, except that the recent small increased percentages from zones 28 and 11appear to be maintained. 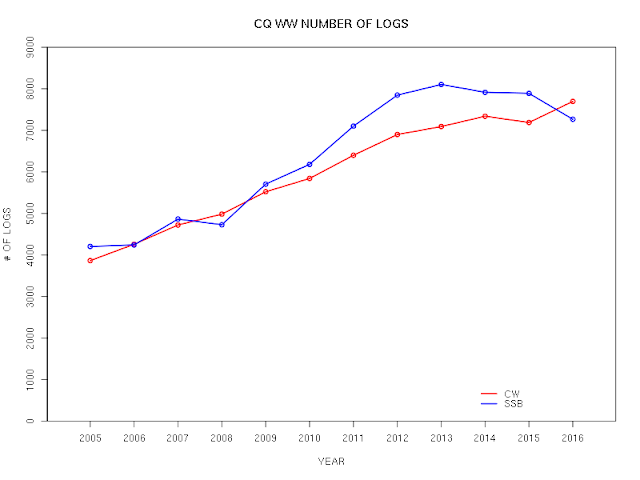 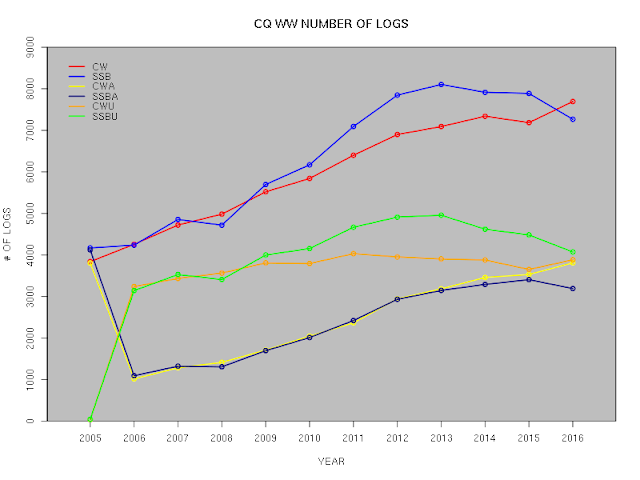 The long-term downward trend in the numbers of QSOs in the assisted logs continues, as does the difference of roughly one hundred QSOs between CW and SSB logs (in favour of CW). 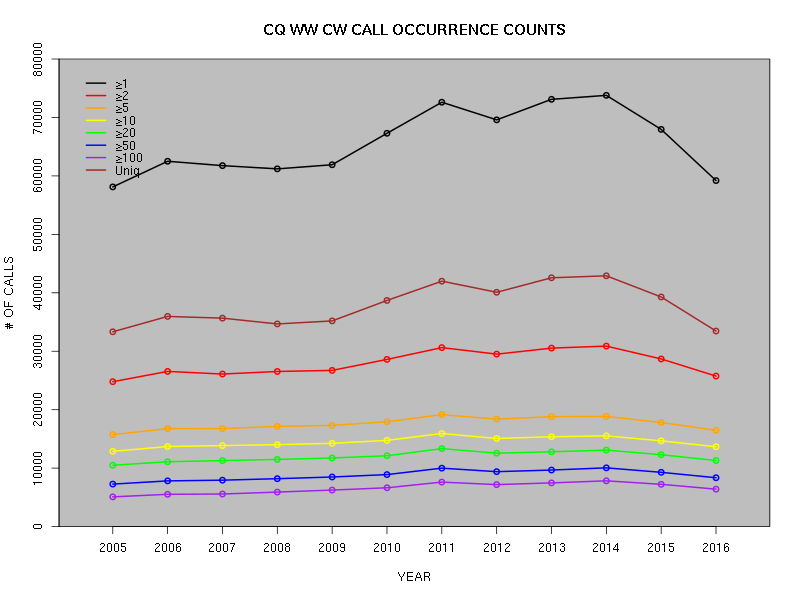 Let's look at how the number of calls in CQ WW logs, which is a reasonable metric for the basic popularity of the contest, has changed over the years. 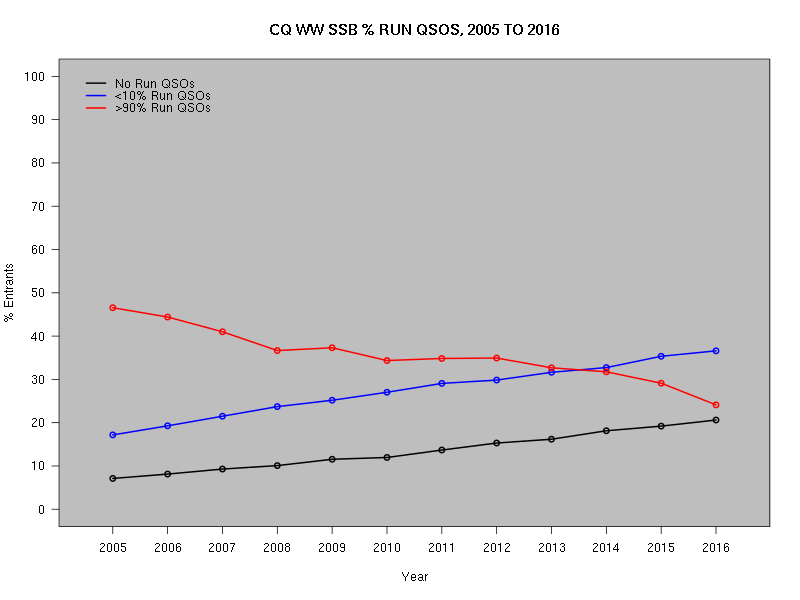 Both modes show that 2016 is more or less identical to 2005, with no obvious underlying growth over the past solar cycle. 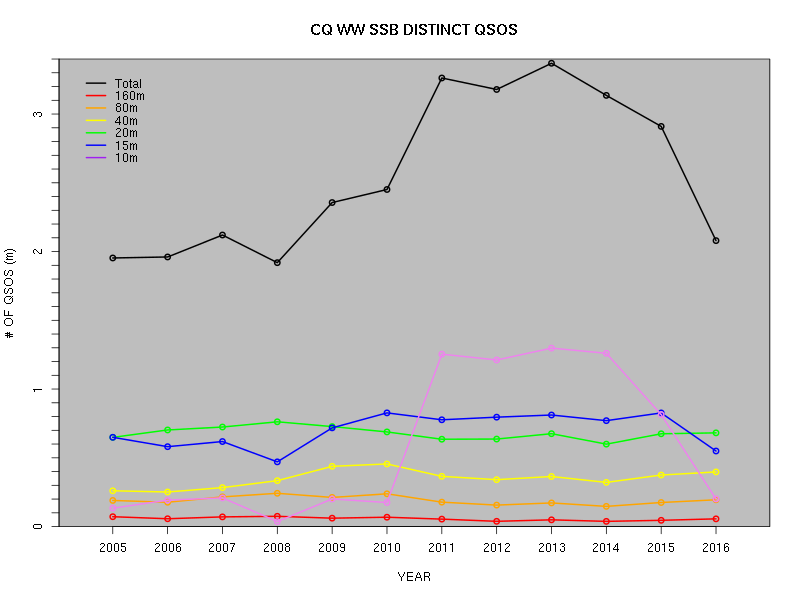 It's also of some interest to plot the year-by-year number of distinct QSOs made on each band. By "distinct" I mean that a QSO both sides of which are logged by entrants counts just once. 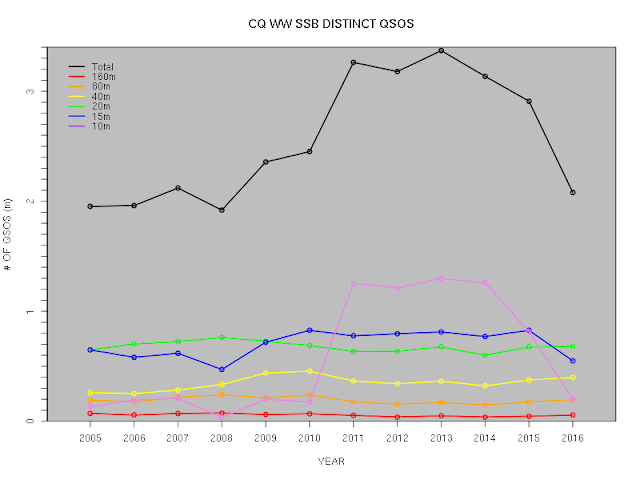 As usual, 40m and 20m support roughly the same number of QSOs, with all bands except 10m and 15m more or less unaffected by the solar cycle. In 2016, the situation on SSB reverted to its low-sunspot-number configuration. 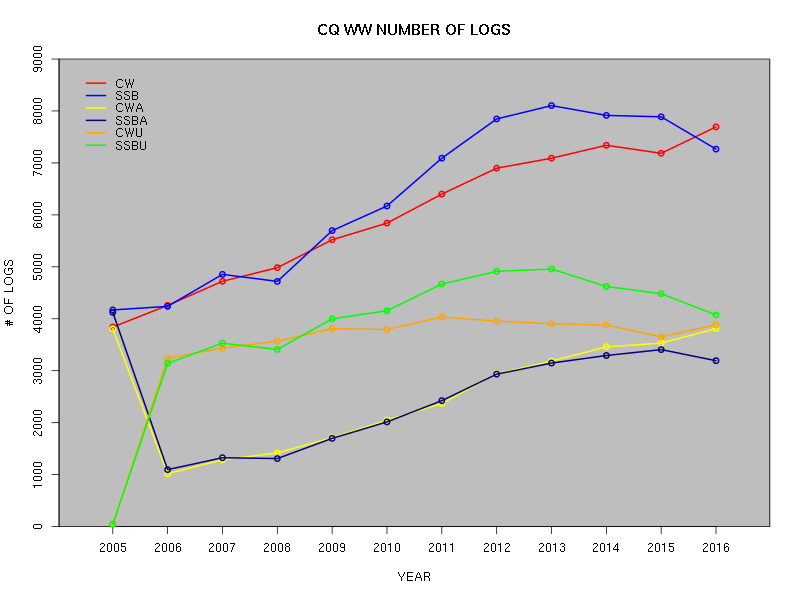 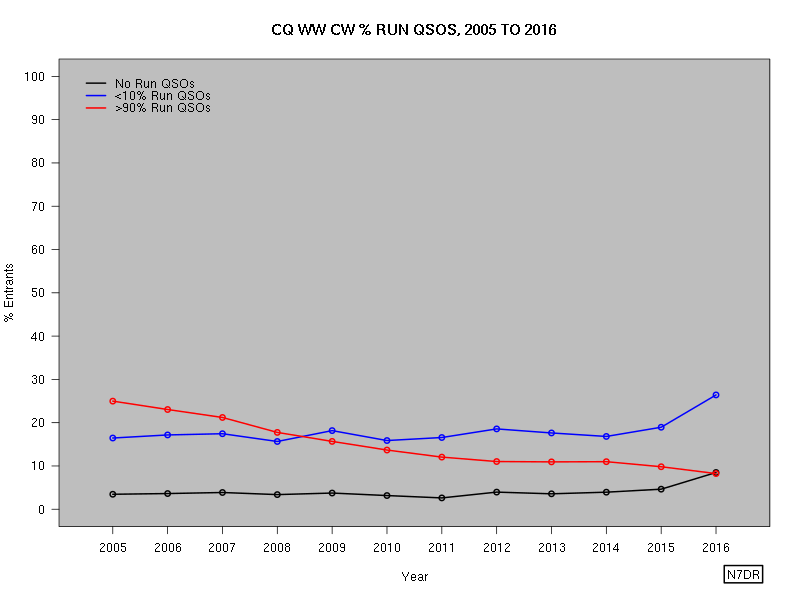 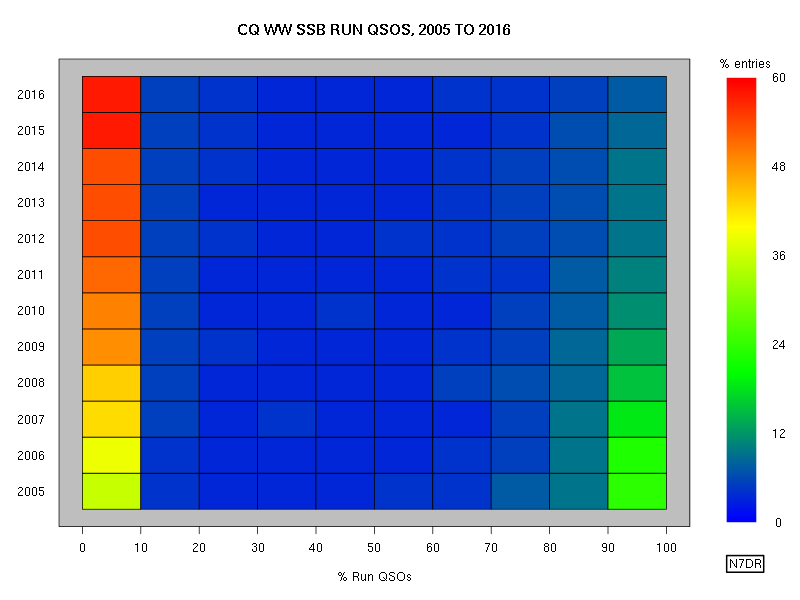 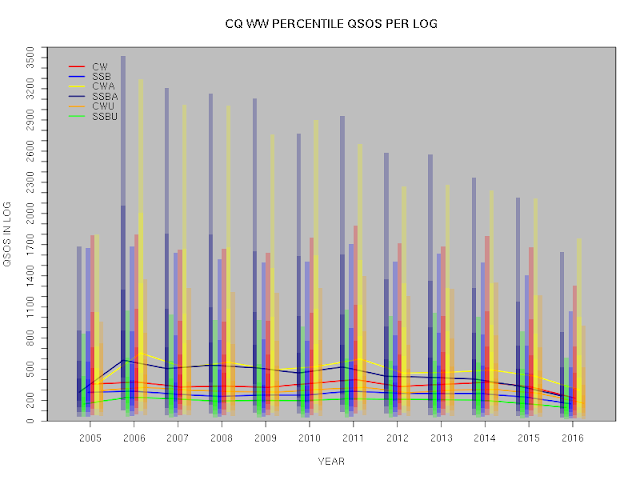 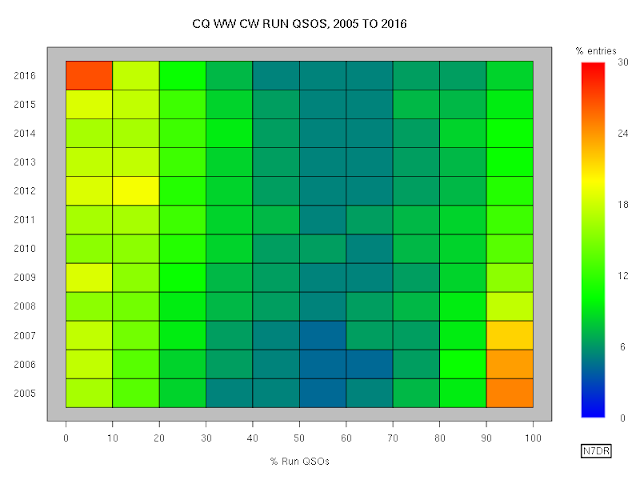 Over the course of the last cycle, the total number of QSOs in CQ WW CW has increased slightly (but one could hardly conclude that contesting is experiencing any kind of surge in popularity), and on SSB that has been no perceptible overall change in the number of logged QSOs since the last minimum.